Dr. Wayne Law is a postdoctoral research associate with The New York Botanical Garden, while Dr. Michael J. Balick serves as Vice President for Botanical Science, as well as Director and Philecology Curator with the Institute of Economic Botany. 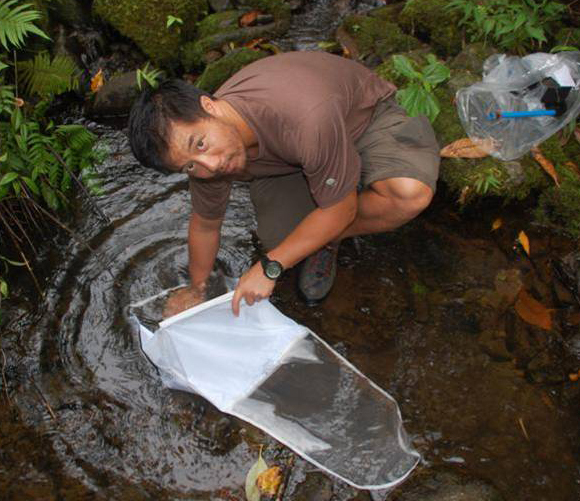 Together, their studies on the ecosystems of Micronesia have spanned over ten years. 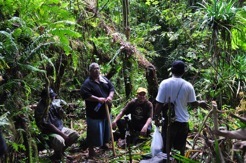 Conservationists discuss the impact of clearing upland forests in Micronesia. Approximately two thousand miles southwest of Hawaii are the thousands of small islands that make up the area known as Micronesia. Identified as one of the world’s 25 biodiversity hotspots, the region boasts one of the highest rates of endemism, or plants found nowhere else in the world. The central group of these islands is known as the Caroline Islands, and the high islands (volcanic in origin) of Pohnpei and Kosrae are the easternmost of this group. Over ten years ago, we started working in Pohnpei where we saw a similar pattern on these islands to what is happening throughout the world: modernization is leading to the loss of traditional knowledge as it is no longer being passed on to the younger generations. Wayne Law shows workshop participants how to use sampling equipment in streams. Since traditional knowledge is often tied into botanical diversity, the loss of one often leads to a loss of another. We partnered with the local traditional leaders, community members, and local organizations in this area with the goal of helping to protect the traditional knowledge and biological diversity of these unique islands through documentation and encouraging the practice of traditional activities. So far, this has lead to the publication of an ethnobotanical compendium of Pohnpeian lore and belief, a Primary Health Care Manual that links traditional uses of plants for health and healing with western medical knowledge, and a checklist of the flowering plants of Pohnpei. Several years ago we began carrying out surveys documenting the upland forest biodiversity including plants, fleshy fungi, and stream organisms. While working on these islands, we learned that one of the most significant threats to the unique upland forest systems of Pohnpei and Kosrae was the deforestation of forests to grow a commercially valuable plant, Piper methysticum, locally known as sakau. Ph.D. student Thomas Jenkinson examines a mushroom specimen. To raise awareness on sustainable management, conservation, and sustainable development of forests, the United Nations General Assembly declared 2011 the “International Year of Forests.” It therefore seemed like an opportune time to share with the island communities the findings from our research on the biodiversity in the upland forest islands, in hopes they would find it useful to address the threats to the valuable and truly unique upland forest ecosystems of Micronesia. The local conservation organizations, Conservation Society of Pohnpei (CSP) and Kosrae Conservation and Safety Organization (KCSO), were excited about raising awareness of the scientific discoveries we had made in the islands. Together we hosted a workshop to present the findings and provide a platform for local leaders and community members to develop policies to help slow deforestation, while at the same time ensuring that people can continue to obtain economic benefits from these ecosystems. Government and community leaders, conservation organizations, and community members from Kosrae and Pohnpei gathered in the capital of Pohnpei for three days to learn about the scientific discoveries, participate in a field trip, and discuss new strategies to protect the upland habitats—critical for the health of the island and its people. During the first day we presented the biodiversity research conducted in the upland forests. Wayne Law and Michael Balick represented The New York Botanical Garden and spoke about the botanical and traditional knowledge that we have been documenting for Pohnpei and Kosrae. We also spoke about the changes that upland forest clearings are causing on forest community structure and species abundance, decreasing tree abundance and species diversity, while increasing herbaceous plants and invasive species abundance and diversity. Dr. Richard MacKenzie takes stream composition measurements. 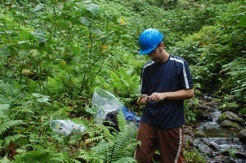 Our collaborator, Ken Wood, from The National Tropical Botanical Garden, spoke about exploration in the upland forest’s most remote areas and how these intensive surveys increased knowledge of the Kosraean flora by five percent, including the discovery of a species never previously described by science, Psychotria kosraensis. Dr. Richard MacKenzie of the USDA Forest Service shared with the group the discovery of many new, previously undescribed aquatic insects, such as mites, moths, and caddisflies. When people clear upland forests, the diversity and abundance of some aquatic organisms increases, but there is a shift in composition of the organisms present in streams which appears to be altering the diets of those organisms that live in the streams. 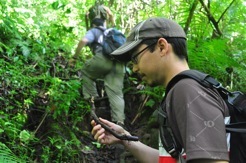 Thomas Jenkinson, representing the mycological team from San Francisco State University and currently a Ph.D. student at University of Michigan, announced that they had collected over 150 species of mushrooms on Kosrae and Pohnpei that had never been recorded from these islands. Previously, only three fungal species had been documented—and this was during an early NYBG trip focused on higher plants. While the number of unique species of fungi on the islands is still being determined, it was apparent that upland forest clearings are a threat to fungal organisms, both by decreasing the abundance and species diversity of the fungi. Finally, sediment data was presented indicating higher amounts of sediment reaching streams in areas below upland forest clearings. Despite the heat and humidity, participants hiked several hours to the study site. 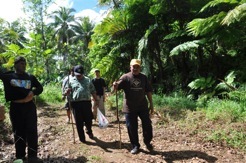 On the second day, participants were invited to attend a field trip to visit sakau clearings and take part in some of the biodiversity surveys. Despite being a hot and humid day, participants hiked up the steep path and through the forest for hours. Half of the group then participated in visual surveys of the streams using goggles and snorkels to look for stream organisms, and also used sampling nets to catch smaller organisms. The other half of the group walked through the forest measuring plant and fungal diversity. 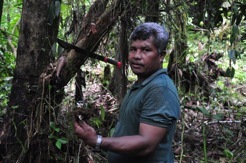 Emos Eperiam, a forest ranger with CSP, finds a Cordyceps--a fungus that parasitizes insects. At the end of the workshop, participants were motivated by the invigorating discussions and realized that the gathering was a valuable opportunity for people from both islands to learn together and exchange ideas. The participants concluded that only with a unified partnership can substantial progress be made in preserving the ecosystems of Pohnpei and Kosrae. The entire document can be found on the Micronesia Challenge Website in the FSM link under the biodiversity references link. One of the goals of the international research program at The New York Botanical Garden is to have as broad and positive an impact as possible, particularly in the areas where we work. This research project, sponsored by The National Science Foundation (grant #0743375) has resulted in the discovery of many new organisms and enabled better understanding of how watershed forests are impacted by agriculture. It has further offered valuable educational experiences to community members and policy makers on these two islands, providing tools, training and incentive to work together in the spirit of conservation and a healthy environment for their people—now and in the future.